Microsoft has this morning introduced Xbox Music, a new music streaming service that will be available for free (with ads) on Windows 8 and Windows RT computers and tablets. Xbox Music will also be available on Xbox 360 and other tablets, PCs, and phones — without advertising — with an Xbox Music Pass subscription priced at $9.99 per month. Xbox Music is the “first all-in-one music service that gives you the freedom to stream custom-created playlists for free,” insists Microsoft. To provide an “all-in-one” experience, Xbox Music takes free streaming, the ability to purchase songs and albums, a music subscription service, and artist-based radio and rolls them all into one service. Using the power of “the cloud,” the service also aims to provide you with seamless access to all of your favorite tracks in one place — no matter where you are or which device you’re using. There are a three ways to access Xbox Music: Those with a Windows 8 or Windows RT tablet or PC will be able to enjoy on-demand access to tens of millions of songs for free, with support from advertisements, on these devices. With an Xbox Music Pass, priced at $9.99, users can also enjoy the service on others tablets, PCs, and phones — including Windows Phone 8 handsets — and on Xbox 360 without having to listen to adverts. This also unlocks unlimited access to tens of thousands of music videos on Xbox 360. Finally, you can also use the Xbox Music Store on Windows 8, Windows RT, and Windows Phone 8 devices to purchase tracks or albums that you want to hold onto forever. Xbox Music will initially make its debut on Tuesday, October 16, alongside an Xbox 360 dashboard update. It will offer a “global catalog on par with iTunes,” with over 30 million tracks, from day one. On October 26, Xbox Music will expand its reach to Windows 8, Windows RT, and Windows Phone 8 tablets, PCs, and smartphones in 15 markets worldwide. Microsoft will then continue to rollout Xbox Music in new regions around the world in the coming year. The company also promises to add a “scan-and-match” feature to the service, which will allow users to add all the music they own to their Xbox Music cloud catalog — much like iTunes Match. You can check out Microsoft’s full press release below. Are you looking forward to Xbox Music? REDMOND, Wash. — Oct. 14, 2012 — Today, people need to use multiple music services to get exactly what they want. There are download-to-own music services, Internet radio services and subscription services that allow you to consume all the music you want. But, as more music services have emerged, it’s become harder than ever to enjoy the music you want — and to experience it the way you want it, on any device. Whether it’s music you’ve purchased on your smartphone, a music app on your tablet, listening to songs through the living room TV or turning to Internet radio on your PC at work, the music you love is scattered across different services. Enjoying music today requires too much work. To solve this problem, Microsoft Corp. is introducing Xbox Music, the first all-in-one music service that gives you the freedom to stream custom-created playlists for free, subscribe to all the music you want or download-to-own your favorite songs. Through the power of the cloud, it effortlessly integrates the music experience across your tablet, PC, phone and TV.1 With more than 30 million songs in the global catalog, Xbox Music begins rolling out around the world tomorrow on Xbox 360 and later this month on Windows 8 and Windows RT PCs and tablets and on mobile phones, starting with Windows Phone 8 at launch and additional platforms later. Free streaming1 music on Windows 8 and Windows RT. 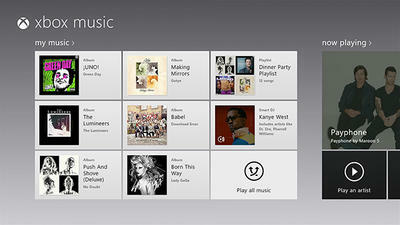 Enjoy on-demand access to tens of millions of songs for free on all Windows 8 and Windows RT tablets and PCs. Discovering and enjoying free music on Windows 8 and Windows RT is as easy as typing an artist or song name and hitting “play” — songs are instantly available to stream and for you to create an unlimited amount of playlists. Xbox Music Pass. Want unlimited access to the songs and artists you care about, including offline access? Get an Xbox Music Pass for ad-free, unlimited playback of any track in our subscription catalog across your tablet, PC, phone and Xbox 3601 for US$9.99 per month.2 Xbox Music Pass also unlocks unlimited access to tens of thousands of music videos on your Xbox 360. Xbox Music Store. Want to own the music you love? The Xbox Music Store is a comprehensive MP3 marketplace giving you the opportunity to purchase a single track or entire album on your Windows 8 or Windows RT tablet or PC and Windows Phone 8. Smart DJ. Creating a new form of artist-based radio, the Smart DJ feature is a quick and dynamic way to personalize your collection, discover new favorites and create ultimate playlists by launching instant mixes based on your favorite artists. With unlimited skips and a view of the full recommended music stream, Smart DJ puts you in control of your Internet radio experience. Cloud Storage. Available in the coming year, a scan-and-match feature will take you beyond the 30 million tracks globally offered through Xbox Music. It will add all the music you own to your Xbox Music cloud catalog, including music acquired through other services. This means you can add almost any content you have to your personal Xbox Music collection, even if it’s not available in the Xbox Music catalog. Social Music. Xbox Music will add unique social features in the coming year that let you share your music experiences with friends and family. Platform Expansion. Xbox Music will become available on other platforms in the coming year. Xbox Music isn’t just a listening experience that shows your tracks in spreadsheets and lists. Taking full advantage of every screen on which you enjoy music, Xbox Music elevates your music experiences with striking visuals. As you listen on your tablet, PC, phone or TV,1 your screen comes to life with artist photos, bios, cover art and discography. The ubiquity of Xbox Music is powered by the cloud. Whether it’s free streaming2 on Windows 8 and Windows RT, a subscription on Windows Phone 8 or tuning into a playlist on Xbox 360 — each experience is cloud-based for immediate access to your entire catalog, making music management simple. With the cloud sync feature, your favorite playlists are no longer held captive by the individual device on which they live. For Xbox Music Pass subscribers, you can create the perfect playlist on your Windows 8 or Windows RT tablet and see it automatically appear on your Xbox 360 or Windows Phone 8. Xbox Music launches with a global catalog on par with iTunes, offering 30 million tracks from some of the leading music labels around the world. It will be available on all Windows 8 and Windows RT tablets and PCs and on Windows Phone 8 smartphones, and it will be part of the 2012 console update for Xbox 360. Free streaming1 on Windows 8 and Windows RT tablets and PCs launches Oct. 26 in 15 markets worldwide. Xbox Music Pass will be available for Windows 8, Windows RT and Windows Phone 8 in 22 markets worldwide; it will begin rolling out tomorrow on Xbox 360 in the same markets. 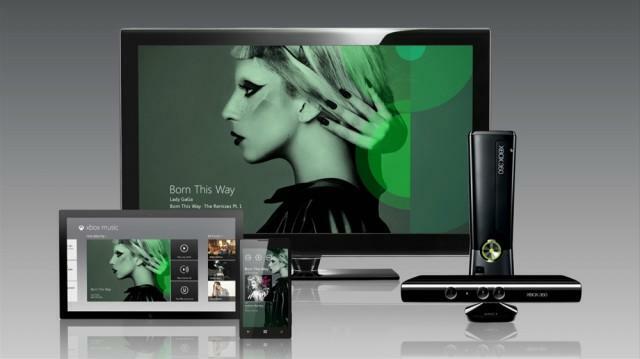 Xbox Music Store will also be accessible on Windows 8, Windows RT and Windows Phone 8 in 22 markets worldwide as devices become available. Microsoft will continue introducing Xbox Music in new regions around the world throughout the coming year. Xbox is Microsoft’s premier entertainment service for the TV, phone, PC and tablet. It’s home to the best and broadest games, as well as one of the world’s largest libraries of music, movies, TV and sports. With Kinect, Xbox 360 transformed gaming and entertainment in the living room with a whole new way to play games and find entertainment — no controller required. More information about Xbox can be found online at http://www.xbox.com. 1 Limited hours of free streaming after 6 months; unlimited with paid subscription. Compatible devices and Internet required; ISP fees apply. On TV, Xbox Music is streaming only and requires an Xbox 360 console and additional subscriptions (each sold separately). Some Xbox Music content may not be available via Xbox Music Pass and may vary over time and by region. See xbox.com/music.